Chatbots are the new apps that live in your customers' favorite messengers, website or app and provide them with one-on-one communication with your brand. These smart talking bots easily integrate into your digital strategy, enrich your business roadmap, and help you enhance customer satisfaction. Chatbots work as personal assistants for your customers. Holding real-time online conversations, bots easily handle all routine queries that don’t require human interaction and match specific customer requests with your best fit business offerings. Create a chatbot to collect customer data and turn it into your competitive advantage. Bots memorize user location, age, gender, preferences, purchase decisions and buying habits. In other words, they help you understand your clients better and know what to sale, when, and how. Customer service chatbots work as personal agents able to carry out multiple conversations at the same time. Capable of learning, chatbots use their memory to provide relevant answers to more and more complex customer queries and improve customer support significantly. Develop a chatbot for popular messengers such as Facebook Messenger, Slack, Skype, WeChat, Kik. With messenger bots your business engages billions of messaging app users directly - no new interface to learn, no more apps to download, no logins or passwords, plain text only. Try Shoppie–demo bot Digiteum team built to show the power of chatbot technology in retail. On average, it takes at least 20 searches for a user to find a trip. 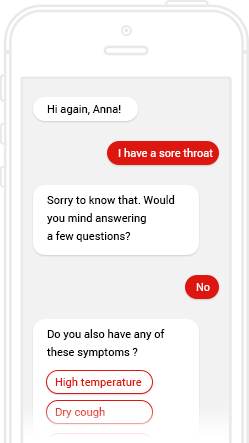 Chatbots squeeze these queries into one simple chat. Virtual travel agents book flights, give travel advice, update, match with travel providers and find the best deals. Hotel bots help clients find the travel best hotel prices. Comparing thousands of offers from hundreds of vendors simultaneously, travel bots easily find perfect options and even contact hotels to negotiate on the deal. Travel assistent bots help customers find flights for specified locations and dates. 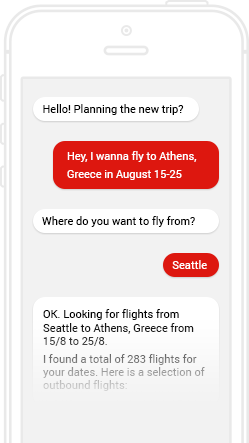 Customers chat with a travel agent bot, provide a city and dates, and get a wide variety of possible flights at a rate of light. Your customer already has a flight? Customer service bot can keep up-to-date on flight status: check for delays, remind arrival time, inform on gate numbers, and much more. At least 43% of US adults find it hard to understand consumer finance; 80% would benefit from professional advice. Chatbots automate this assistance helping people find and compare financial products and services. Banking chatbots allow users to transfer money, check their balance, credit score, and spending limits, use online banking with voice commands, and ask for financial advice without any need to contact banks directly. Using chatbot service, financial organizations can broadcast and inform customers on the latest market updates, stock quotes, exchnge rates, upcoming deals. 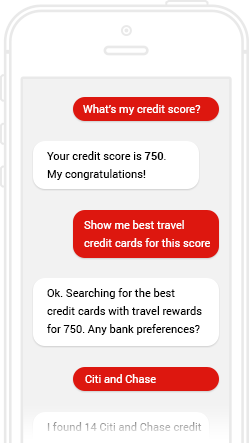 Chatbots can work as personal finance assistants: search for the best credit cards and rewards, collect consumer information, match users with financial products, and connect with a human agent if needed. Retail ecommerce companies deal with 70% of abandoned cart rate and the losses from poor customer service on mobile. Chatbots solve these problems suggesting efficient customer service and faster response on messengers. Shopping bot can become a personal assistant that uses conversation to determine the shopper’s intent and personalize provided recommendations based on shopper's purchase habits. Retail chatbots can make gift suggestions, process orders, manage "out of stock" products, notify on product availability, send shipping and delivery updates, and collect customer feedback. Store finders can handle frequent customer queries, for example, where to find specific products or stores. Shopping bots help users make purchase decisions, offer discount codes, upsell or cross-sell other products. 74% of Millennials are willing to trust chatbots at restaurants. Tech savvy generation, Millennials specifically favor food bots that save their time making express food order, table reservations, and cooking advice. 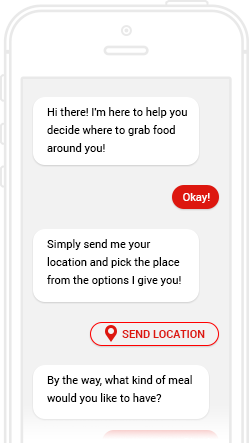 Food ordering and delivery chatbots help people order food, customize delivery time, check out and pay, and receive confirmations right in their messengers. Cooking bots and advisory bots allow users to search for recipes and find store locations. Since over 50% of recipe searches happen in grocery store aisles, your bot may be of great use to your customers. Food bots can manage marketing campaigns, drive sales, and contribute to brand awareness. Bots offer free samples and giveaways, sell giftcards, advertise activities in the venues and update on schedules and events. Recent polls show that 60% of patients are willing to communicate with care givers electronically. Chatbot technology is a user-friendly tool for digital healthcare experience. Applying health bots, patients easily handle routine tasks via chat. Chatbots connected to various medical databases help patients optimize their medical search and provide data on diagnoses, treatment and medications more efficiently. Bots can provide data on healthcare related issues, send recommendations from accredited doctors, connect to specific specialists in case of first indications of certain symptoms, and call ambulance if needed. Chatbot development companies already build the bots that help doctors and nurses keep patient records updated, stay connected and updated, and perform smart search and medical data management. We are proud of our bots! Alexa Chatbot Skill uses voice audio interface to recommend and sell books via Amazon or Audible, engage readers and keep them updated on what’s new on the shelves. Hindi chatbot uses gamification to help learners and scholars study Hindi and enlarge their vocabulary. Chatbot encourages users to leave feedback and contribute to Oxford online Hindi Dictionary. 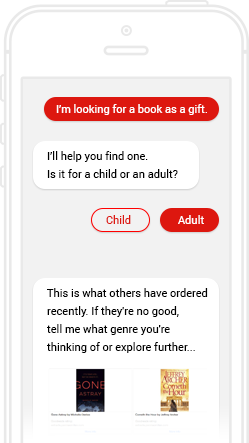 This Facebook chatbot is a smart agent that helps people choose and order books online, tailors its recommendations specifically to the customer’s needs, and broadcasts the publisher’s products right in Messenger. Let’s see how our custom bots can match your business needs. Fill in the form, and we will get in touch within a day.